DALLAGO TOURS KENYA-TANZANIA – is an African tours and safaris operator in Kenya, Uganda, Ethiopia, South Africa, Tanzania, including Zanzibar Island, Seychelles, Mahe Islands. In these countries, we are the best for Camping Safaris, Lodge Safaris, Short and long Safaris, Luxury safaris, safari excursions, beach holidays, honeymoon safaris, weddings safaris, mountain climbing and desert tours mostly in Egypt. We are the best Africa safaris company for Kenya safaris, Tanzania safaris, Uganda camping safaris, Uganda tours, Kenya africa vacations, Kenya travel for holiday and all about tourism in Kenya Tanzania and Uganda. 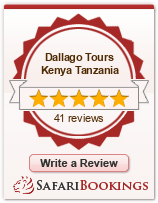 Dallago Tours Kenya-Tanzania stands out as one of the most experienced and reliable tour operator in Kenya. With offices in Nairobi and Mombasa, We expertly handles safaris to all tourist destinations in Kenya, Tanzania, Uganda, Egypt, Ethiopia and South Africa. Over the years we have built an experienced and dependable workforce and an elaborate ground transport network. Every Dallago Tours Kenya-Tanzania safari mini-bus is comfortable and designed with a large pop-up roof for the best view and photography of wild animals. All Dallago Tours Kenya-Tanzania Safari guides have an average experience of ten years in game tracking and are knowledgeable about the people, flora and fauna of the country. The success of our safari will largely depend on the quality of our accommodation. Dallago Tours Kenya-Tanzania offers luxury (Lodge) Safaris where you are accommodated in carefully selected lodges and hotels which will make you feel very out of Africa yet very close to nature. And what else? Dallago has everything for everybody!! For the budget travelers, Dallago Tours Kenya-Tanzania owns fully equipped camps in most of Kenya game reserves with well trained personnel. Just come to us with the spirit of adventure and we will make your dream come true.